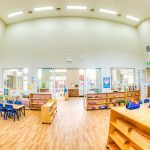 Gymea Montessori Academy delivers a modern Montessori education program for infants, toddlers and preschools. The campus’ three spacious Montessori classrooms are bright, happy, and well-resourced with the best Montessori learning materials available internationally. 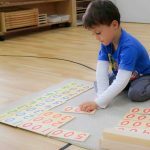 The Montessori materials in each classroom are specially designed to encourage hands-on learning, independence, problem solving, and concentration. 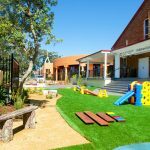 In addition, our Gymea child care centre offers two vibrant outdoor play areas, complete with garden, veggie patch, motor activities, tricycle tracks, and sandpits. The seamless integration of engaging classrooms, and oasis-like outdoor play areas, offers children the ideal place to imagine, learn and grow at their own pace. 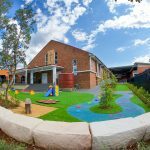 Especially unique about Gymea Montessori Academy, is the campus’ wonderful sense of community. Each child’s cultural, religious and family background is respected and celebrated. Thus, Gymea Montessori Academy creates a wonderful learning environment that is focused on inclusion, learning, and the full development of the child. Furthermore, our Gymea students are guided in their learning by our team of passionate early childhood professionals. Our teachers are specially trained in the Montessori philosophy, in order to observe and guide each child’s unique development journey. In this way, it is our aim to naturally guide each child towards their full potential. As a result, Gymea Montessori Academy’s graduating students are well prepared for school, and a life time of learning.